Ten Poems about Gardens is for gardeners and visitors to gardens, the green-fingered and the willing admirer who nonetheless doesn’t know their trowel from their hoe; the allotment-holder and the flower-grower. Like the gardens they describe, the poems range between formality and informality, elegance and sweet-scented shades of mystery. “Good gardening …needs poetry to capture, measure and catalogue. …That is what this little volume does perfectly. It is a garden catalogue and a manual spelling out the really important horticultural skills. 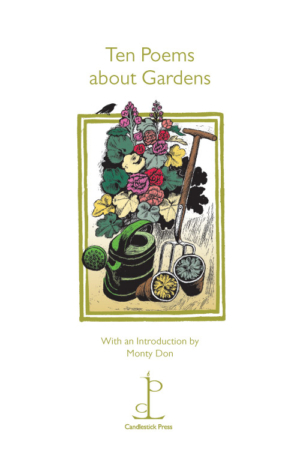 …These are all fine poems, all perfectly practical celebrations of why and how to garden. Read them with soil under your nails and to cultivate all that grows within. Read them and go out and garden the better for it.” Monty Don, Introduction to Ten Poems about Gardens.